We incorporated flexible spaces to give owners the options they need to meld this charming, three-bedroom, country home to their personal style. A large common area combines the great room and dining room under a vaulted ceiling punctuated with operable skylights and is semi-open to a smart, angled kitchen with breakfast bay. The great room expands outdoors to a deep, covered back porch. The master suite has upstairs privacy, a generous bath, and ample closet space. 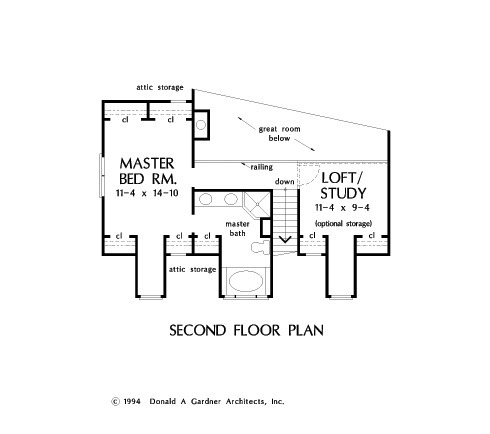 The front bedroom/study can double as a guest room, while the second level loft/study makes a nice office or play room. 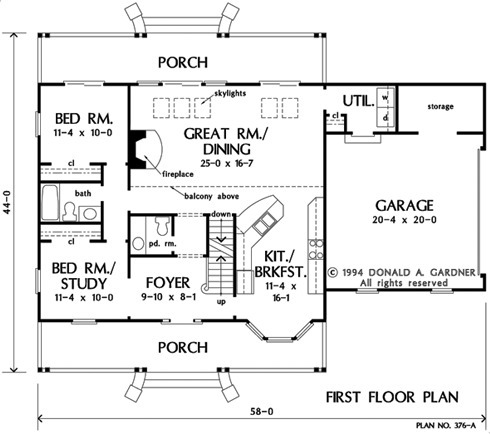 1st Floor: 1234 Sq. 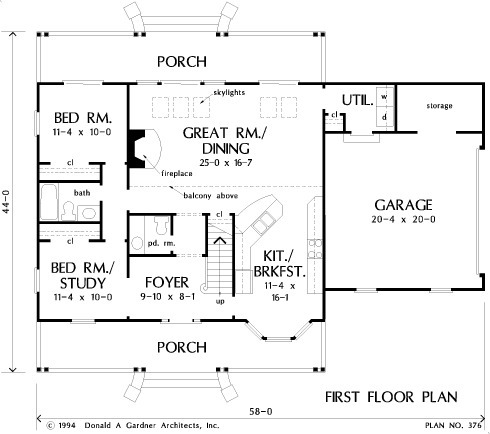 Ft.
House Dimensions: 58' 0" x 44' 0"
Great Room: 25' 0" x 16' 7"
Master Bedroom: 11' 4" x 14' 10"
Foyer : 9' 10" x 8' 1" x 8' 0"
Great Room (Vaulted): 25' 0" x 16' 7" x 21' 2"
Kitchen : 11' 4" x 16' 1" x 8' 0"
Utility Room : 6' 4" x 6' 0" x 8' 0"
Garage Storage : 11' 0" x 6' 0" x 0' 0"
Master Bedroom : 11' 4" x 14' 10" x 8' 0"
Bedroom / Study : 11' 4" x 10' 0" x 8' 0"
Porch - Front : 37' 4" x 6' 6" x 0' 0"
Porch - Rear : 37' 4" x 6' 6" x 0' 0"
Loft / Study : 11' 4" x 9' 4" x 8' 0"
Other : 4' 0" x 2' 0" x 8' 0"